This video will show you how to make Vegetable Yaki Gyoza (fried dumplings)! 1. Wrap the cabbage with plastic wrap and microwave at 500W for 3 minutes until tender. Finely chop the cabbage then squeeze in paper towels to remove excess water. 2. Finely chop the onion, sprinkle with a bit of salt, then wash and drain well with paper towels. *in this way you can remove the bitter taste and bring up the sweetness of the onion. 3. Finely chop the carrot and the long onion. 4. Mix 1-3 in a bowl, then mix in starch to let it absorb the water. 5. Add A and mix well. 6. Place the gyoza wrapper in your palm and place a spoonful of filling in the center. Put water along the edge of the wrapper by fingers, fold into semi circle, gather the front side of the wrapper and seal. 7. 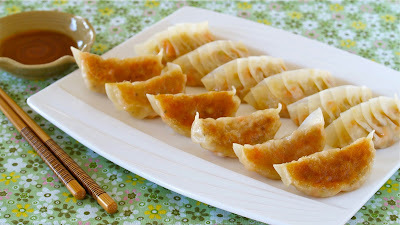 Heat sesame oil in a frying pan, place gyoza, cook on high heat until the bottoms become brown. 8. Turn the heat down to medium, add 50ml water (or about 1/3 of their hight), cover and steam the gyoza on med-high heat until cooked. Uncover and cook on high heat until the water is gone and crisp. This Gyoza is already seasoned but you can serve them with a mixture of vinegar, a little soy sauce, and a few drops of la-yu if you like.